Jones Exhaust 2.5 in. 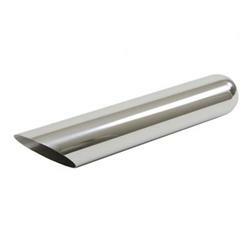 Stainless Exhaust Tip 18.0 in. Long [Jones PAC318-212SS Exhaust Tip] - $29.95 : 3rd Strike Performance, Your Source for Late Model MOPAR Performance Parts and Accessories! These Jones Exhaust Systems stainless exhaust tips are American-made and offer you performance construction with a showroom finish! Jones stainless exhaust tips are available in a wide variety of styles, designs, and applications for all of your exhaust needs. Inlet Diameter (in): 2.500 in. Tip Outlet Size: 3.0 in. Overall Length (in): 18.000 in. Tip Cut: Slant 45 degree cut.